A sound is a form of energy that is produced when air molecules vibrate in a particular pattern called waves. Hence, the sound is a wave. 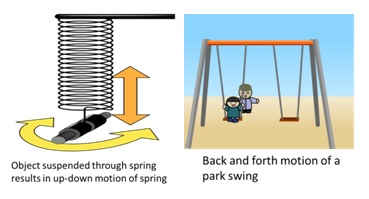 Vibration can be described as a back and forth motion of an object. Depending upon the vibrations, a sound is produced. Sound cannot be produced without any vibration. How do humans produce sound? Human beings have a voice box or larynx which is present in their throat on the upper side of the windpipe. The larynx has two vocal cords which have a narrow slit between them so that air can pass through it. As the lungs throw the air out of the windpipe, it passes through the slit and hence allows the production of sound as the vocal cords start vibrating. The vocal cord muscles also play a role in the production of sound. Their thickness and tightness describe the quality or type of the voice a person has. The vocal cords in males are of length 20 mm and females have 15mm long vocal cords. Children, on the other hand, have very short length vocal cords. Hence, the voices, their quality and their type are always different in women, men and children. Sound always requires a medium to travel from the source of its production to the receiver end. 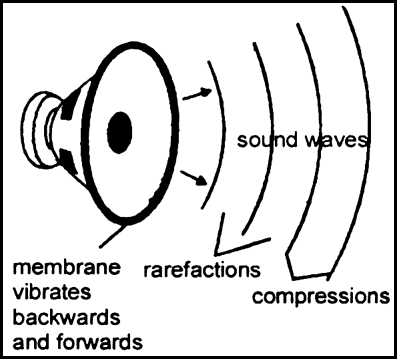 Different mediums of propagation of sound are air, liquid and solids. Sound cannot travel through a vacuum as it lacks any medium of transmission. How sound travels in a medium? Sound needs some vibration of molecules to travel. Solids, liquids and gases all have molecules present in them which allow the propagation of sound. These molecules or particles in solids, liquids and gases are packed in varied ways. Solids have tightly packed particles in them and hence they allow fast propagation of sound through them as the vibrations can be carried easily from one particle to another. Liquids have slightly loosely packed particles and hence it takes a little time for sound to travel in water or through a liquid. Gases have completely loosely packed particles and hence sound takes the most time in travelling through the air. Sound through water travels 4 times faster than through the air. Sound through solids travels 13 times faster than through the air. We know that sounds are produced as waves in the air or any other medium. As these sound waves travel to our ears they convert them into electrical signals or messages that our brain can understand. Our ears have a special structure that allows this function. The outer ear (Pinna): It catches the sound waves and forwards them to the next part of the ear, that is, the middle ear. 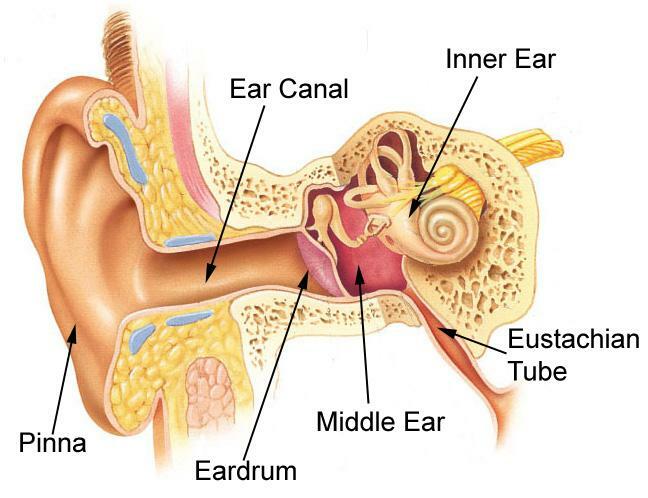 The middle ear: It converts the sound waves into vibrations that then travel to the inner ear. It can do this with the help of the eardrum. The eardrum is a thin rubber-like sheet present in the Middle ear. As the sound waves reach the eardrum, it vibrates and these vibrations propagate to the inner ear. The inner ear (cochlea): It receives the vibrations sent by the eardrum. It contains a liquid substance and the vibrations that enter the inner ear moves through this liquid. There are tiny hairs present inside the inner ear that turn these vibrations into signals for the brain and pass them to the brain through the hearing nerve. As the brain receives the signal it interprets the sound. However, this whole process is so quick that we cannot notice it. When an object travels in a ‘to and fro’ motion, that is, when an object vibrates it is said to have an oscillatory motion. An oscillation is said to be the movement of the object from one point to another in a periodic time. One oscillation is said to be the movement between the two endpoints or extreme points of the motion of the object. The number of oscillations an object takes per second is called its frequency. 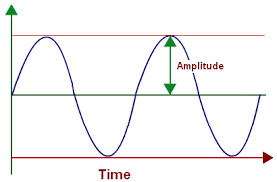 The time taken for one complete oscillation of a sound wave is called the time period of the sound wave. 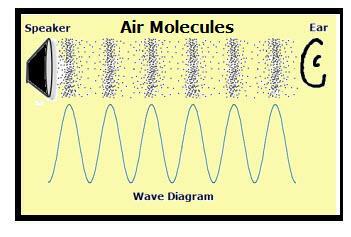 The number of molecules that a sound wave displaces from the mean position creates the amplitude of the sound wave. The amplitude of a sound wave can be defined as the maximum displacement of the particles from their mean position due to the vibrations. The loudness of a sound depends upon the amplitude of the sound. 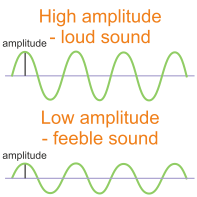 The higher the amplitude, the higher is the displacement of the particles and the higher is the loudness of the sound. The loudness of the sound is directly proportional to the square of its amplitude. 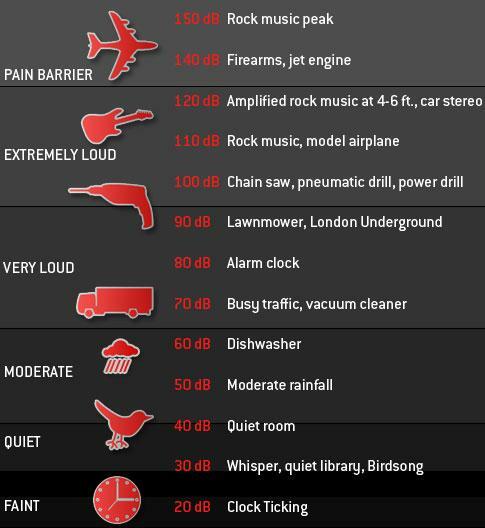 The SI unit for measuring the loudness of a sound in decibels (dB). Every person has a different sound quality. Also, every musical instrument vibrates to produce a different kind of sound. 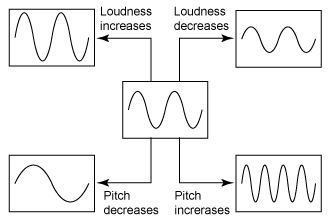 This quality of sound is characterized by its Different quality of sounds may have same pitch and loudness. The pitch of a sound depends upon the frequency of the sound wave. The pitch would be higher if the frequency of the sound is high. How Loudness and Pitch are different from each other? It depends upon the frequency of the sound. The loudness of a sound depends upon the amplitude of the sound wave. Pitch of a sound is how our ears react to the frequency of a sound. The loudness of sound also depends upon the energy of the sound wave. 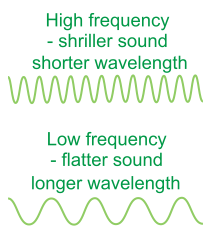 Pitch of the sound helps in recognizing whether the sound is shriller or flatter. The loudness of a sound helps in recognizing whether a sound is loud or feeble. Sounds that can be heard by human ears are called audible sounds. The range of audible sounds is from 20 Hz to 20 KHz. Sounds that cannot be heard by human ears are called inaudible sound. Any sounds having a frequency less than 20 Hz or greater than 20 KHz are categorized as inaudible sounds. The inaudible sounds can be divided into two categories as infrasound and ultrasound. The sounds having a frequency range below 20 hertz are called infrasound. The sound waves having a frequency range above 20 kilohertz are called ultrasounds. 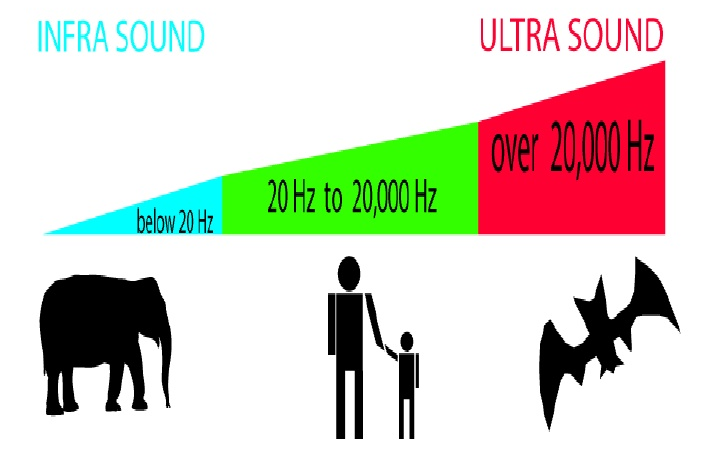 Infrasound cannot be heard by humans. Having too high frequency, they cannot be heard by human beings as well. Animals like giraffe, rhinoceros and whales use infrasound to communicate. Bats, dogs and cats use ultrasounds to communicate. Ultrasounds can be used for various purposes such as identifying abnormalities in the human body or calculating distances under the water through SONAR. Noise can be regarded as an unpleasant sound. 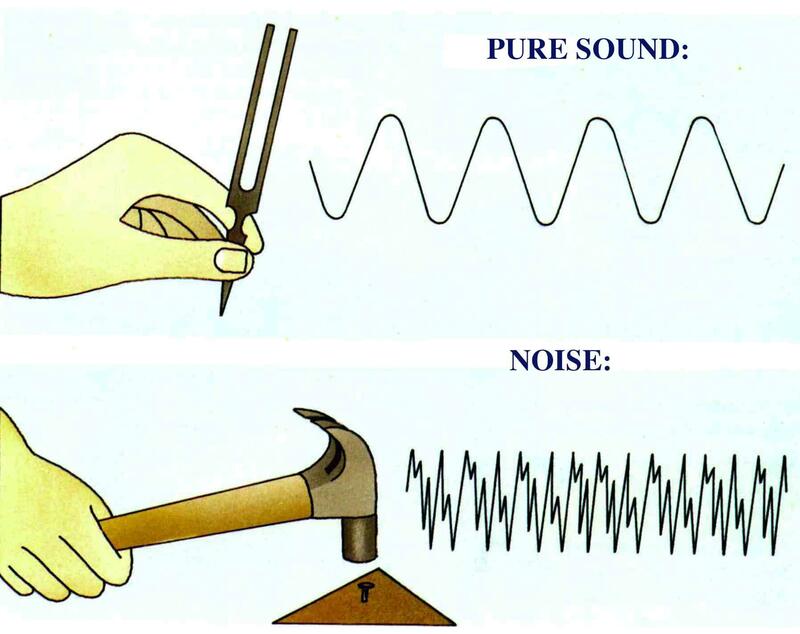 Noise consists of sound waves of varied frequencies which have no particular periodic pattern of repetition. Therefore, noise is regarded as a mixture of sound waves with irregular frequencies. Music, on the other hand, is a pleasant sound that has a clear pitch. Musical sound can be created by arranging and combining different sounds in a particular order. The frequencies of a musical sound are harmonious in nature. 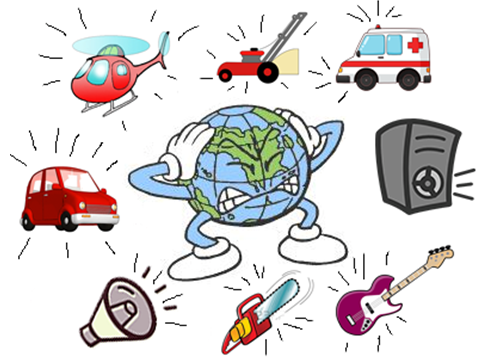 Noise pollution can be defined as the presence of undesirable and unpleasant sounds in the earth's environment. Human beings can bear sounds ranging up to 85 decibels only. Above that, any noise can damage our hearing power. Generally, any sound that has a frequency of more than 30 dB is considered noise. The unwanted noise causes an adverse effect on the health of the organisms present on the earth. According to the World Health Organization, the maximum sound limit that is ideal for cities is 45 dB only. However, it has been found that the sound range in many big cities of the world lies up to 90 dB. Hence noise pollution is common in many cities today and even rural areas to a great extent. Transport noise: The sound of the traffic on roads, railways and aircraft leads to noise pollution. As the number of vehicles such as cars, motorcycles, buses and trucks is increasing in the cities, especially the Metropolitans, noise pollution is extremely high there. Industrial noise: Industries, factories and other commercial businesses cause high-intensity sounds that pollute the environment. Neighbourhood noise: The noise from the radios, televisions, air conditioners, coolers, kitchen applications and other electrical appliances used in houses lead to noise. Not only this, commercialization around the residential areas often leads to unwanted sounds due to small-scale industries such as printing, car repairing etc. Construction noise: Construction of houses, industries and various architectures also lead to sound pollution. Political activities: Noise pollution is also created due to the rallies and demonstrations conducted by various political parties in cities and rural areas. Bursting of crackers and fireworks: People burst crackers on several occasions such as festivals and ceremonies that lead to sound pollution in the neighbourhoods. Natural sounds: The environment of the earth also sometimes leads to unpleasant sounds due to lightning, thunderstorms, earthquakes, volcanic eruptions, sounds of various animals etc. Excessive noise in the surroundings can lead to serious health problems such as hypertension, lack of sleep or insomnia, anxiety, lack of memory, stress, irritation and even nervous breakdown. It can lead to temporary or permanent hearing loss in human beings as well as animals. Excessive noise leads to increased blood pressure. It increases cholesterol levels in the blood and therefore increases the chances of cardiovascular diseases in a person. 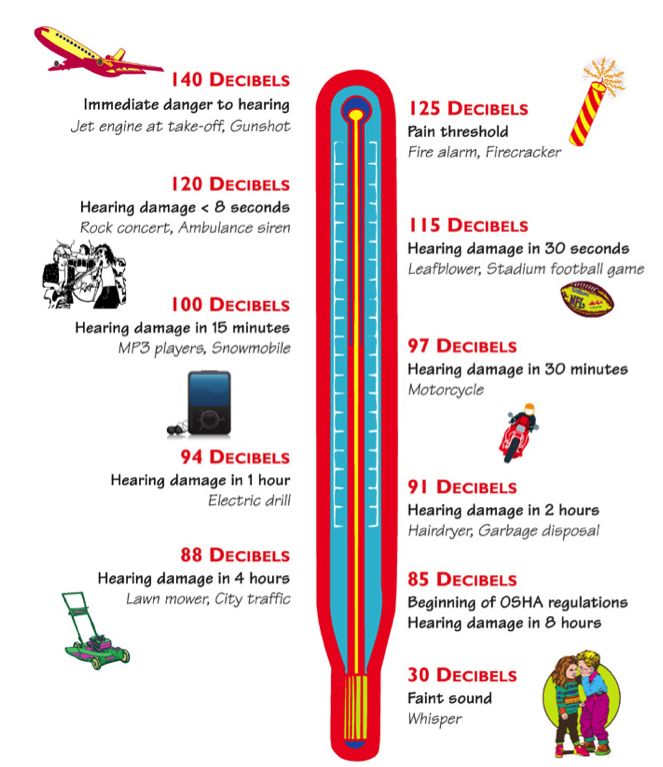 If sound intensity is more than 180 dB it can lead to the death of a person. Noise pollution also leads to a decrease in the production of digestive juices by our body. It can affect animals as well and can lead to their death and loss of habitats. Excessive noise decreases a person's ability to concentrate especially on children and they are unable to concentrate well on their studies due to neighbourhood noises. Unwanted sounds in the environment can hinder the animals from finding their prey or their direction of motion. Factories and other industries should be set up at a distance from residential areas. Silencing devices should be incorporated into heavy vehicles such as aircraft, industrial equipment, machinery and other home appliances. We should always play television, radio and other music systems at a low sound so that it does not harm the neighbourhood. Use of horns should be minimized especially near public places such as hospitals, religious places and schools. Soundproofing systems should be installed in industries, party halls and other buildings that produce a high amount of unwanted sounds. Trees should be planted in huge numbers as they can absorb unwanted noise from the environment. People who work in noisy conditions such as industries and mines should be provided earplugs to protect their ears. People should be made aware of noise pollution its adverse effects so that they can take an active involvement in preventing it.